In 1999, a K-Pop act coming to the United States and holding concerts in two major venues would seem like an impossible act. With the conclusion of the American leg of their 15th anniversary concert tour, g.o.d did just that. 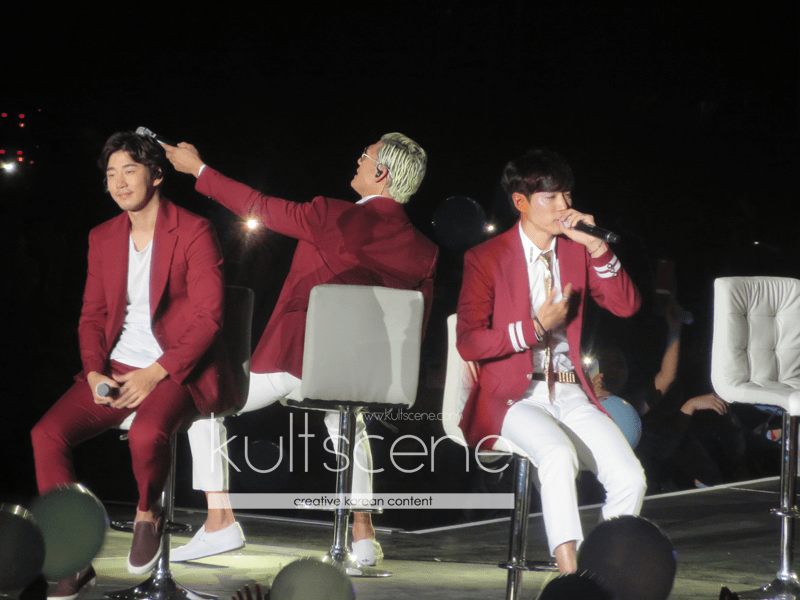 On November 9th, 2014, g.o.d held its second show in the United States at the Prudential Center in Newark, New Jersey. 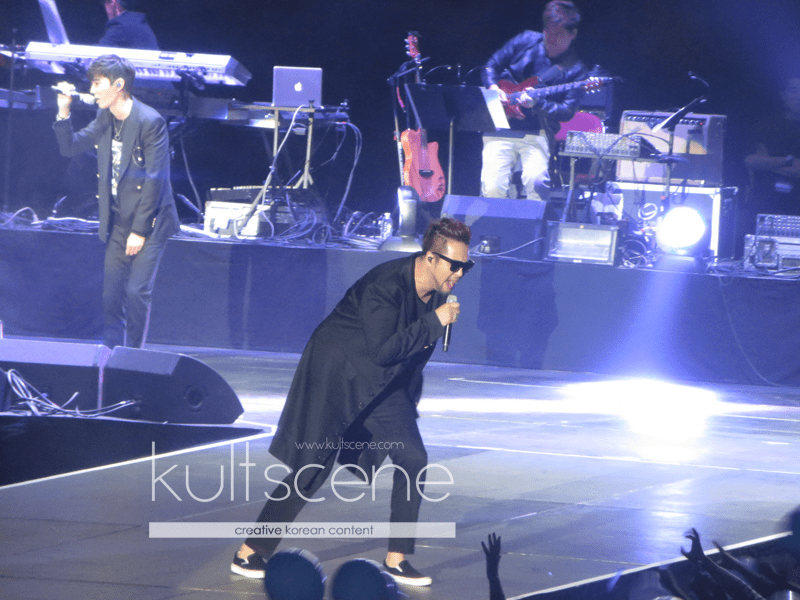 The g.o.d 15th Anniversary Reunion Concert Tour began in Seoul on July 12th, and its show in New Jersey rounded out the concert series in a big way. The crowd at the Prudential Center was dominated by a different fanbase than most K-Pop concerts that have been held in New York and New Jersey. g.o.d’s longtime fans came out that night, making an older, more Korean audience than most East Coast shows have typically seen. And it was absolutely fantastic. 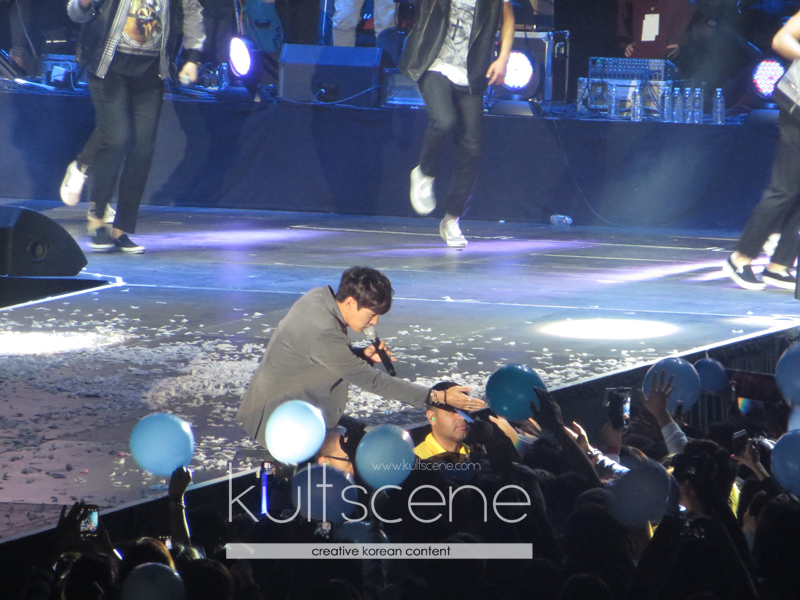 The connection between the five men performing on stage and the audience members was almost tangible, as the fanchants were sung and the sky blue balloons bobbed up and down. With few of the typical lightsticks, enterprising audience members used their phone’s flashlights the same way people used to hold lighters at concerts. Even before the concert began, the fans were excited, itching for the show to begin. This wasn’t just fans waiting for a performance— fans who had waited for the long-promised return of all five members together filled the audience, and g.o.d delivered just that. The concert began with a photomontage containing clips and images from each year of g.o.d’s fifteen year career, with words indicating the members’ thankfulness towards fans remaining loyal despite the long break in g.o.d’s career. Then, Son Ho Young, Kim Tae Woo, Danny Ahn, Park Joon Hyung, and Yoon Kye Sang appeared on stage and performed The Lone Duckling, their first song released together since 2005. As they performed, fans throughout the stadium stood up, and many didn’t sit down until the concert came to a close. The live band, something missing from many K-Pop concerts, was a nice touch that had fans stomping their feet and chanting “g.o.d, g.o.d” to the tune of We Will Rock You several times throughout the night. The setlist included all of g.o.d’s most popular songs, ranging from their debut to their most recent comeback. To Mother, One Candle, Saturday Night, Friday Night, 2♡, and many other songs that fans had been waiting for years to hear. g.o.d’s unique colors and years of experience showed as Kim Tae Woo and Son Ho Young showed off their powerful vocals while each of the three rappers (Park Joon Hyung, Yoon Key Sang, and Danny Ahn) provided their own flavor to every song. 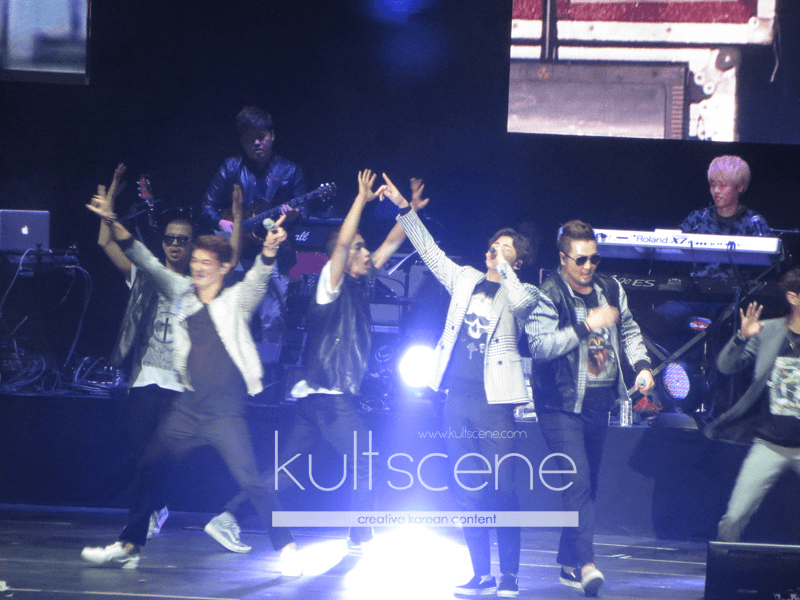 The five members kept the crowd, and themselves, moving nonstop. Whenever the singers came to a rest, it looked like they were absolutely exhausted. The members’ age showed (none are younger than 33, with Park Joon Hyung being the eldest at 45), but even as they joked about their aching limbs, g.o.d reassured the audience that they planned on being on stage for many more years to come. The entire night was powerful, filled with both emotion and energy, highs and lows as both g.o.d and the audience got excited with one song’s powerful beats and then reminiscent with each ballad that brought many memories to the surface. Considering that the crowd and the group interacted throughout the show and every song was well performed, there was really no single highlight moment because the entire show was fantastic. There were some hilarious moments, including when g.o.d tried to teach the audience the dance to Saturday Night and it turned out that Yoon Kae Song wasn’t so great at the dance himself, and some heartbreaking moments, including Danny tearing up over being reunited and performing for the first time in the United States. When it was time to go, the fans shouted out and demanded “Encore, Encore” over again. A slideshow with pictures that Danny had taken throughout the years appeared, with words thanking g.o.d’s fans for always supporting the group. g.o.d returned to stage with three songs, and new energy that had them jumping around stage looking like any other K-Pop act. Son Ho Young played with the crowd, spitting water onto the audience to cool people off, while Danny took numerous pictures on stage using his selca stick –pictures that will undoubtedly appear in another g.o.d slideshow in the future. g.o.d and their fans have been through a lot over the years, but during the New Jersey show, one thing was apparent: even after 15 years of ups and downs, fans will never abandon the group, and, in return, g.o.d will give fans everything that they can. Have you ever seen g.o.d perform live? What’s your favorite g.o.d song? Be sure to subscribe to the site and follow us on Facebook, Twitter, Instagram, and Tumblr to keep up with all of our posts.